Protests show Russians have something they want to protect. I got home in a stellar mood last night. I was soaked to the bone, knee-deep in mud, with the handles torn off my purse and a few bruises on my ribs. But I’ve never been better. 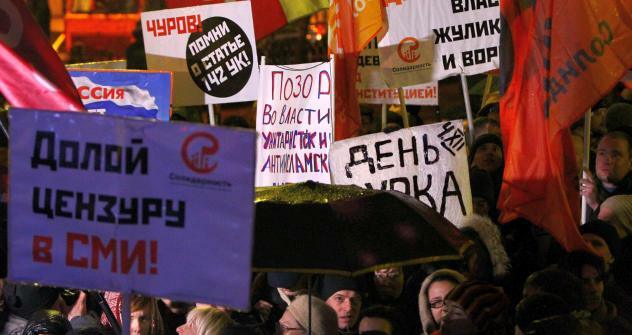 I went to the protest held at Chistiye Prudy in Moscow last night, not as a journalist, but as a citizen. I decided that no matter what trouble I’d get into, my press card would stay put – this was about my voice, not my profession. Russia’s climate seems to be set against democracy in the country, as cold rain poured all night over the crowds that gathered on the boulevard, tuning the once tidy lawns into thick pools of slush. But pressed up hard against each other and squeezing tighter yet to make room for the newcomers, few at the rally seemed to care about appearances. Various estimates place the number of people anywhere between 2,000 and 10,000. I would say I saw at least 5,000 to 6,000 pairs of sparkling eyes. This was the first demonstration in Moscow I’ve witnessed of this magnitude. But the most important was the atmosphere: People took to the streets en masse not because they hoped to somehow rectify the fraud and vote rigging that plagued Sunday’s parliamentary elections (they’ve already given up on that), but as an emotional show of solidarity, to look each other in the eye, to confirm that no matter what the regime says or does, they will stand united in their opposition. The sense of unity permeated the air; calls for change, for fair presidential elections, for a future without Putin and without United Russia from the stage reverberated through the crowd that seemed to breathe in unison. “Obviously, there is no need to calm down. As for the calls for new elections, we have new elections coming up in March, where we can show these gentlemen exactly what we think of them. I want to say, with all responsibility, that unfortunately in the 1990s, we failed to make proper use of freedom. It came down from above. But over the past few years, a real civil society has been formed in Russia, and it won’t disappear. I can see it before me. Never before in Moscow was there such a feeling of unity and determination,” writer Dmitry Bykov, the mastermind behind the satirical Citizen Poet series, told the cheering crowd. It seems that the biggest point of the protest was to scare the authorities a little. But judging by the number of soldiers brought into Moscow today, the current regime is scared indeed. Anna Arutiunova is the executive editor of Russia Profile.